Just provide your address and billing information here to get your instant access card. Activate it with your first payment and you can schedule a doctor consultation right now. Questions? Contact us at 888-899-8297. We will email your temporary access card right away. Your permanent card will be sent to you at the mailing address you specify below. Email Address* Please enter a valid email. This field is required. Please use a different email address. Address* This field is required. This field is limited to 35 characters. Address 2 This field is limited to 35 characters. City is required. State is required. Zip is required. Zip is invalid. Date of birth year is required. Date of birth month is required. Date of birth day is required. Gender is required. Phone Number* Please enter a valid phone number with the area code. This field is required. You must agree to the terms before continuing to the next step. 30 Day Money Back Guarantee. Consultations through Carefree M.D. are not available in Arkansas and Washington. Once we receive your first payment, you can set up your account and schedule your first doctor consultation by phone or online - in just minutes. Credit Card Number is required. Credit Card Number is invalid. Exp Date is required. Exp Date is invalid. We only accept VISA, American Express, Mastercard and Discover. Card verification value is invalid. Card verification value is required. I Agree! Activate my Membership! You are now a Carefree MD + Home Expense Protection member! Your peace of mind is our only goal. Our team is ready to help redesign how you live your life and find the balance you deserve. To get started, click the Log In button below and follow the instructions provided. Our system has encountered an error, and your enrollment cannot be processed at this time. You can submit again by clicking the button below, or give us a call at 888-899-8297 so we can get you taken care of. 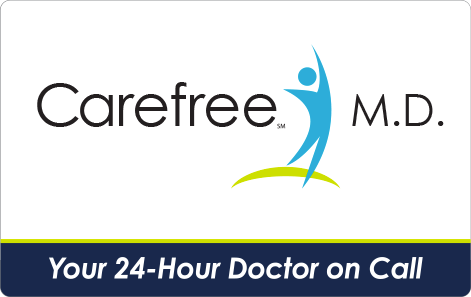 Feel Better Faster with Carefree M.D. Call 888-899-8297 Monday - Friday 8:00 AM to 5:00 PM CST to speak with a representative or visit our contact page. © 2016 Carefree M.D. All rights reserved. Terms and conditions, features, support, pricing, and service options subject to change without notice. Disclosure. Carefree M.D. is NOT insurance. Consultations through Carefree M.D. are not available in Arkansas or Washington. Video consultations are not available in Texas. Only video consults are available in Idaho. For a complete listing of pharmacy providers in your area, please click here. Carefree M.D. is administered by Coverdell & Company, Inc., 8770 W. Bryn Mawr, Suite 1000, Chicago, IL 60631, 1-888-838-4078. You have the right to cancel this plan within 30 days of the effective date for a full refund of fees paid.